After all my talk about fresh herbs not being a good deal unless you grow your own, I finally went out and bought a few plants. For $13.99 +tax, I got an Italian garden, including oregano, basil, flat leaf parsley, sage, chives, and oregano, plus the cool pot to go with. Yes, if I’d planted from seed it might have been less money. But as it was, to buy each herb individually would have cost $2 each. So, I bought six plants and a pot for two dollars a piece. We grow our own herbs here. I’ve been slowly building up my herb garden over the years. From getting starts from people on freecycle, to purchasing organic plants at Home Depot, we have a very good sized herb garden now. Most things come up again every year. The one thing I have to plant yearly is basil because it will not last the winter outside. So, yes, I totally recommend growing your own; especially in the ground. 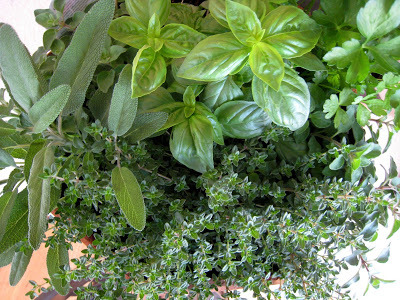 We dried a lot of our home grown herbs this past summer and wow, what a blessing!